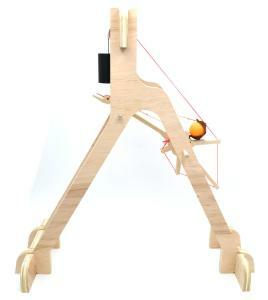 Who knew that the trebuchet, one of the most elegant of all medieval weapons ever invented, could be improved! By redirecting the pulling force of the counterweight with a pulley, the Multi-Radial Linear Node (MURLIN) Trebuchet is able to transfer much more energy to the projectile than the standard trebuchet. 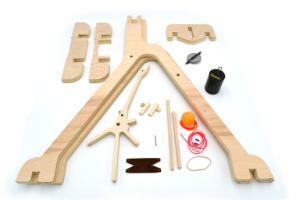 Assembled kit throws the included ping pong ball 30 feet or more. In fact, this system, with only half the throwing arm of our standard trebuchet is able to throw just as far, if not farther. The included guide provides clear assembly instructions with pictures. It also contains pedagogy for exploring concepts of energy transfer using the scientific method. Ordering information: A small Phillip's screwdriver is required for assembly. Delivery information: Kit comes with a step-by-step educational guide.